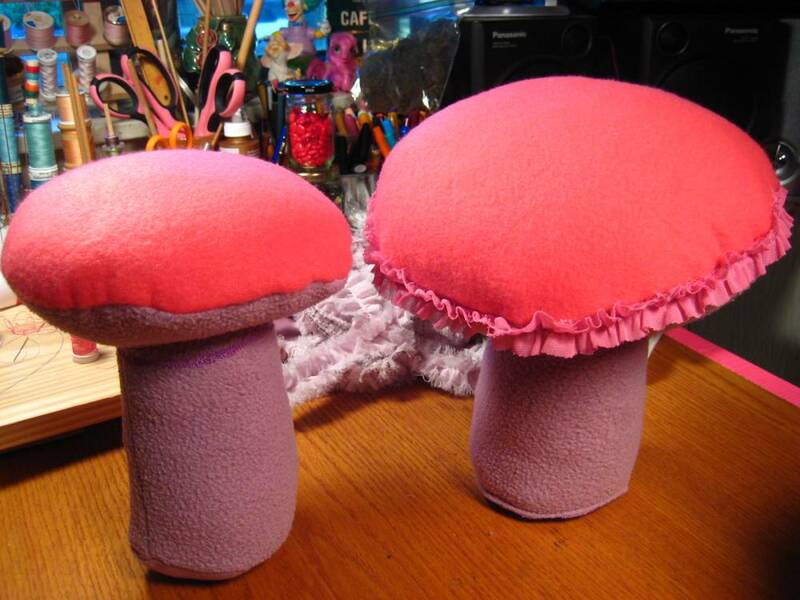 I spent the weekend working out a good mushroom design for my Art Dolls Only Alice in Wonderland project of a hooka smoking caterpiller and his toadstool seat. 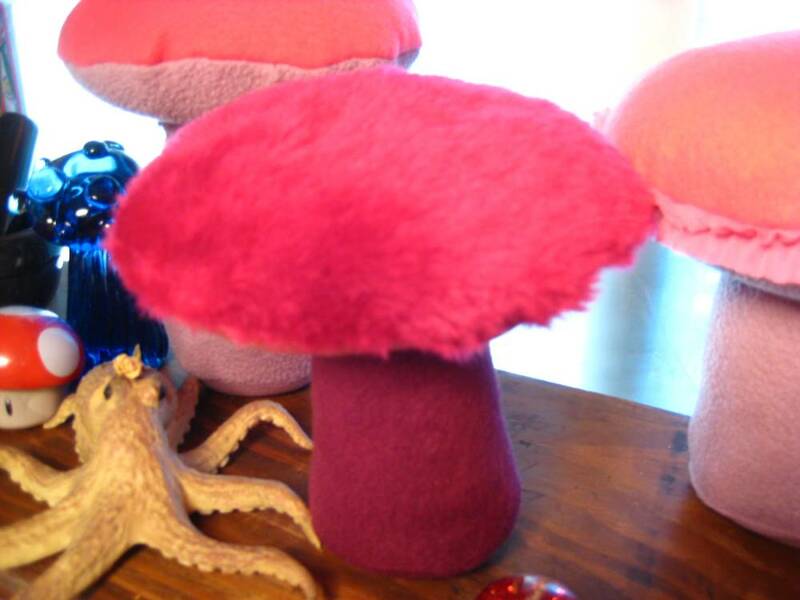 Feeling haunted by a vision of fantasy mushrooms I collected lots of purple and pink materials all kind of fancy and girlie fru fru. I’ve just started, really, to see what looks best. I wanted to refer to natural shapes and form but in an imaginative way. I’ve got vague apparitions of Oscar de la Renta’s gorgeous frill and fluff dancing through my head. Texture was supremely important in creating these lacey dame caps, ruffle adorned mushrooms. I mined closets and drawers for just the right elements. An old lavender sweatshirt, inverted with the rough side out looked great for stems. 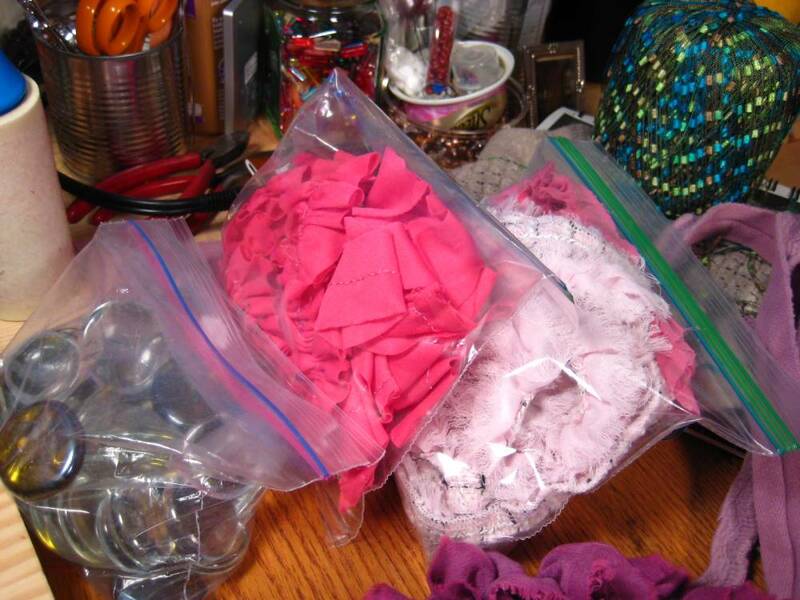 The small pink ruffle on a sleeveless, blouse made of synthetic material sort sparked this whole flood of faux fungi. 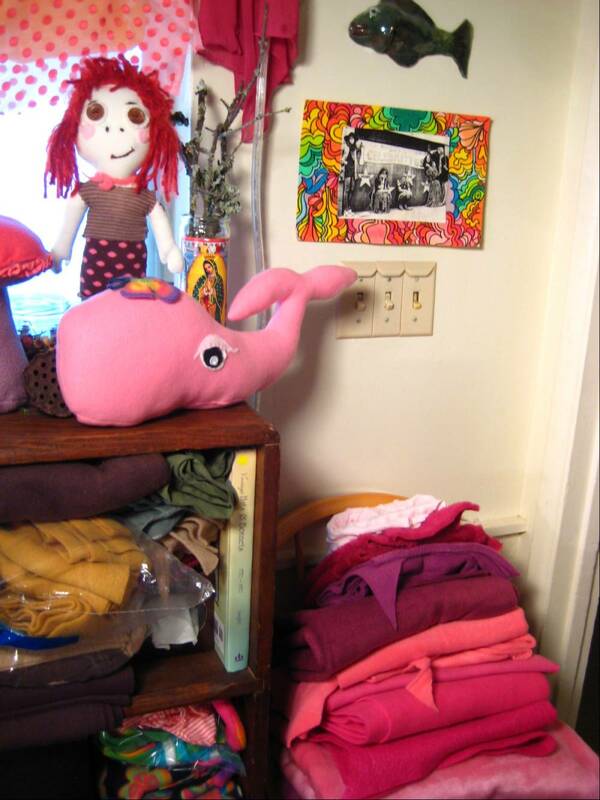 The bright pink fleece worked well for tops. I am finding as I do more work in 3D plush that it’s very much like painting in that I need to look at the work and live with it in order to understand it. Similar, too, is the fact that for me it’s all about the color. I need to see the weekend’s work sitting on the storage shelf where I can contemplate its mushroomness, its completeness. does it need something more? If so, what? Last week this shelf held dolls and now it’s all about the ‘shrooms. 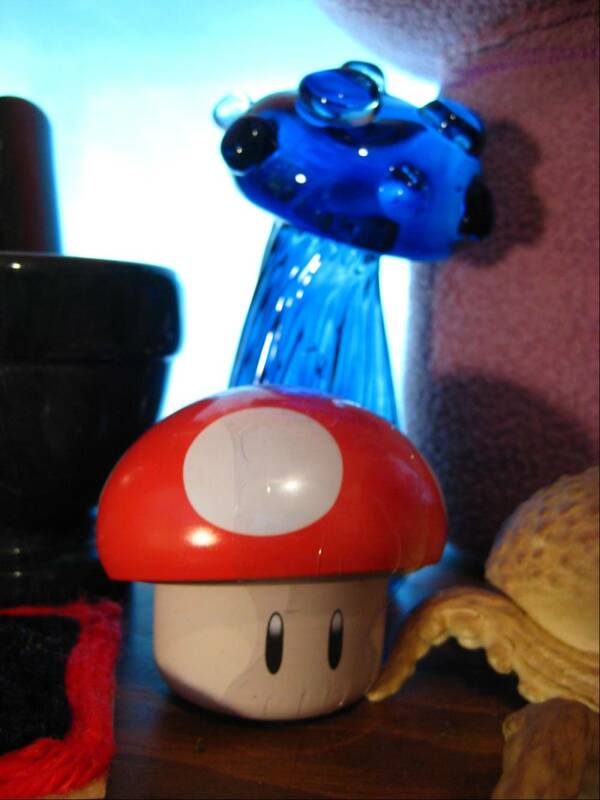 A tin mushroom, Frank’s blue glass mushroom gathered there while the plushies were begging to be let out of my head and into the physical world. 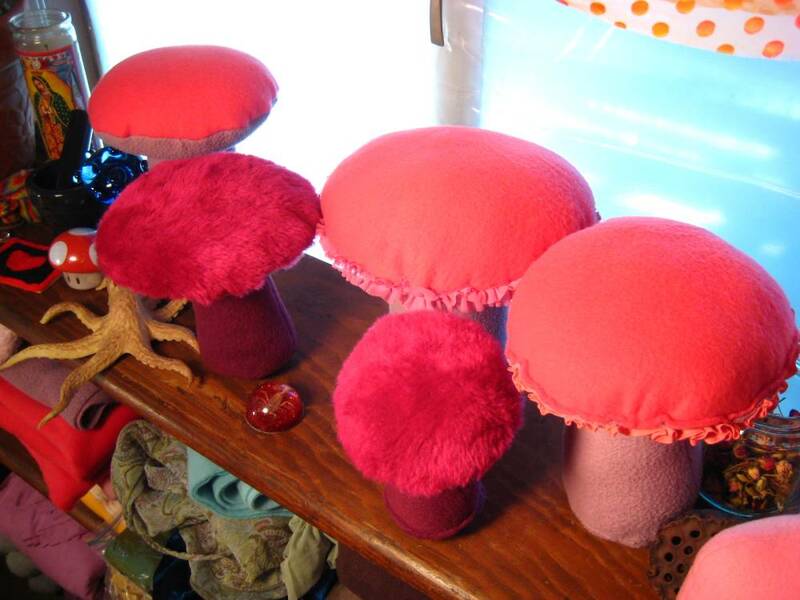 Playing with textures brought out the 70s style long-haired plush mushrooms. Frank thinks they are funny and that is good. 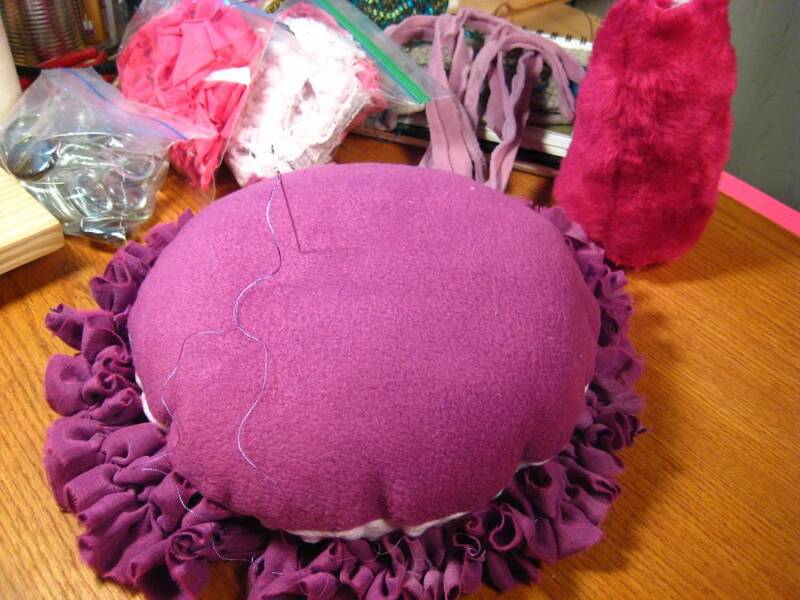 The purple topped mushroom needed something more and I made this purple ruffle from old scarf material. 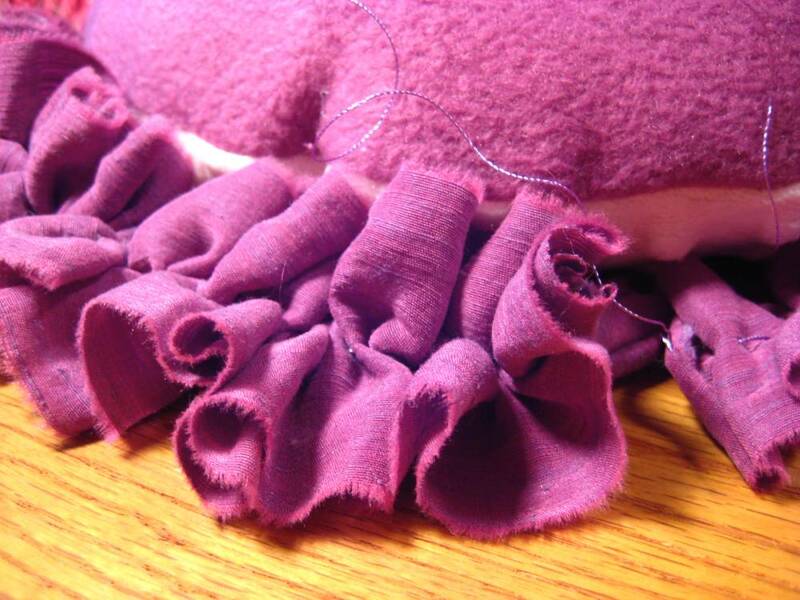 Yesterday after I had worked for hours and hours I was still wanting to stitch up ruffles. My imagination was flying about this material or that material to use. I’m more than a bit obsessive and I just get carried away when I’m intrigued by something. Ask Frank. He knows. The mushrooms are allowing me to get rid of things that have sat idle. I was thinking neck charms when I bought so many fat glass drops. I had lots of little images I wanted to try. I loved the vintage effect of a stamp under glass. 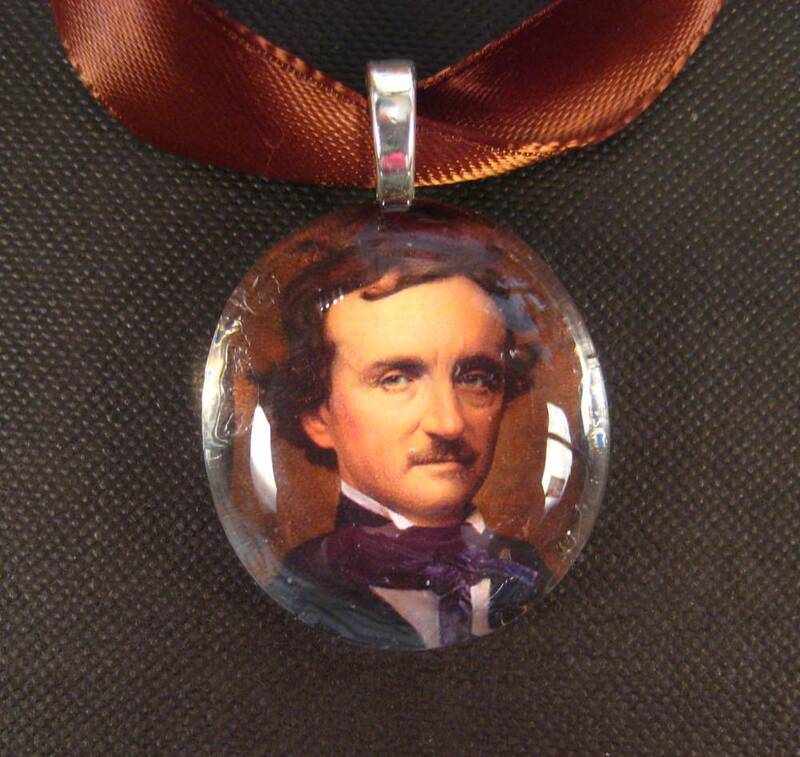 This Poe stamp necklace, with a simple brown ribbon, came out looking swell. I ended up with lots of glass drops because so many have imperfections. You need to buy bags and bags to end up with a dozen unblemished glass circles. I’m still shuffling things around when I feel I should just reduce my possessions but I hate to waste things. I want to create a pleasing something from what might otherwise be discarded. All I need to make my creative urge complete is a gaggle of people in need of funny, fanciful oddities. This entry was posted on June 14, 2010 at 10:19 am and is filed under Art, constructions, design, etsy, handmade, projects with tags frills, mushrooms, Oscar dele Renta, poe stamp necklace, ruffles, visions. You can follow any responses to this entry through the RSS 2.0 feed. You can leave a response, or trackback from your own site. These mushrooms are awesome! You should make some Mario ones. Green ones for an extra life, and red ones for growth. I will do it, Sir! I am your humble servant. (Watching too much of The Tudors). Ewe, that show is like Twilight, but somehow worse. It is a tad over the top in it’s oversexed imperial self-absorbtion but BREAKING BAD IS DONE FOR THE YEAR! Boo. I need to withdraw slowly.